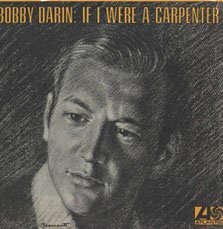 BobbyDarin.net/BobbyDarin.com - "If I Were a Carpenter"
The LP If I Were a Carpenter changed the course of Bobby Darin's career with the title song reaching #8 on Billboard's Top 100. Darin did very well in this folk phase, singing the works of Tim Hardin, Buffy Saint Marie, John Sebastian and John Denver. The LP earned Bobby a Grammy award nomination for "Best Contemporary (Rock & Roll) Solo Vocal Performance." The song "Amy" from Bobby's movie, Gunfight in Abilene, was included on side two. Bobby also was the one who had the suggestion for the catchy bass line heard in "If I Were a Carpenter" which is heard throughout the song. The LP had two other single releases "The Girl Who Stood Beside Me" and "Lovin' You." It was Bobby's last charting LP.